The quality-driven Subaru Legacy is back for another year with all the capabilities, and more, that have come to be expected from the long-running midsize sedan. Developing into its own over the years, the Legacy has emerged as one the safest and most affordable midsize cars on the market. Its high-quality features are both outstanding and efficient, with many updated and new components being introduced for 2014. Fresh packages, enhanced technology, resilient mechanics and incredible fuel economy are just a few of the Legacy's significant offerings. 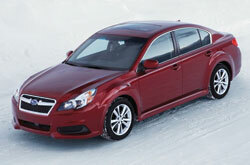 Wrapped up in an all-wheel-drive package, the sedan is a leading candidate for shoppers in the Kansas City area. Designed for frequent traveling, the 2014 Subaru Legacy comes with a competent, fuel-efficient 2.5L boxer four-cylinder engine, delivering 173 horsepower and 174 lb.-ft. of torque. A standard six-speed manual transmission (on 2.5i models) accompanies the powertrain, but buyers do have the option to upgrade to a CVT with adaptive control - noted in Edmund's 2014 Subaru Legacy review. For a little more speed, a 3.6L boxer six-cylinder, producing 256 horsepower and 247 lb.-ft., is also offered with a five-speed automatic transmission and has the ability to go from zero to 60 mph in 7.1 seconds. Joining the Legacy's list of features for the new year is an Alloy Wheel Package equipped with fog lights, chrome trim rings, all-season tires and 17-inch alloy wheels. Putting extra emphasis on security, the EyeSight safety system, outfitted with lane departure warning, adaptive cruise control and pre-collision braking, has also been added to 2.5i Premium models, along with an electroluminescent instrument cluster. Additionally, the Power Moonroof Package now comes with a rearview camera and Subaru's Aha infotainment system is standard with the optional navigation - available on Legacy Sport editions for the first time. 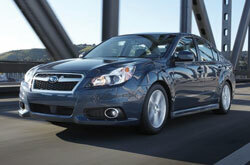 Continue below to learn more about the 2014 Subaru Legacy in Kansas City and its vast amenities. 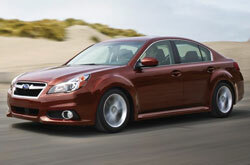 The 2014 Ford Fusion, Chevrolet Malibu and the Honda Accord are outranked by the 2014 Legacy in a variety areas. MO shoppers will be pleased with the Legacy's useful features and inexpensive price. When comparing its price to the forementioned vehicle options you will easily see that Kansas City Subaru customers select it because it's a fantastic value. Take a peek at our Legacy Facts list; look just under this text for bullets. 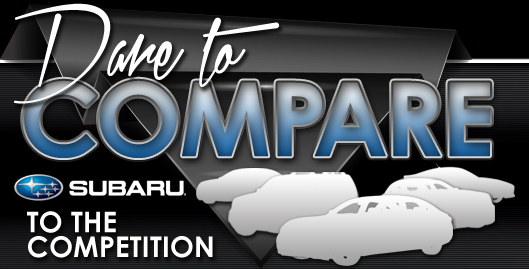 Thank you for selecting Van Subaru as your source for 2014 Subaru Legacy reviews. We take our mission to provide the best reviews composed by automotive experts - it's just one more thing that makes us a respected Subaru dealer in Kansas City. To make intelligent decisions when it comes to your next Subaru purchase, don't guess! Each section is up to the hilt with facts, including info about vehicle features, in an easy-to-understand clear format. Thank you for reading over Van Subaru's 2014 Legacy review. Now that you know more about the Legacy, phone us to learn about exclusive dealership offers and OEM specials that can help you save significantly on your purchase.